Disclosure: We received a free copy of All the Aires France for this review. It seems a long time since we bought our first copy of All the Aires France, back in 2010. Many things have changed since then. Not least of these is that the number of motorhome aires in France has ballooned upwards. 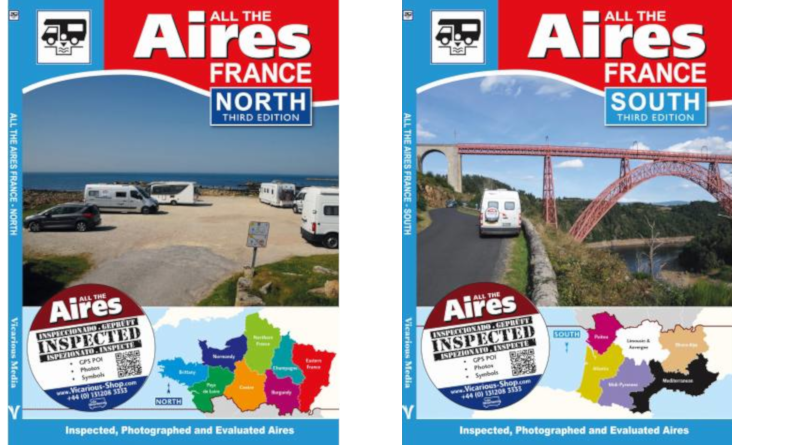 My photos suggest that the All the Aires France guide we used in 2010 contained 1,600 stopover locations. It was a single A5 volume. The latest version of the guide made a much bigger thud when it dropped through my letter box recently, courtesy of Vicarious Media. Since 2015, this guide has been formatted as two A4-size volumes, one for the North and one for the South of France. Together, these contain 3,944 aires. That’s more than double the total from nine years ago. According to authors Chris and Meli, motorhomes now make up about 1% of the traffic they see in France. It’s a pretty astonishing figure but it would help to explain why 1,998 new aires have been opened over the last eight years or so. Just imagine if that happened in the UK? Not likely, I know. But we can dream. Getting back to the guide, happily the winning and easy-to-use format of the original All the Aires guides has never been changed. If you’ve used these guides before you’ll know how easy they are to understand. All you need to know is that this new edition contains 509 new aires that weren’t included in the previous edition. Each guide starts with a fold-out map showing the locations of every aire and also service-point only stops. The map is colour coded for different regions. Next up, there’s a comprehensive guide to the aires system and the detail of how all the different types of service point work (for filling up with fresh water and emptying your toilet/waste water). If you’re new to aires, this is invaluable. This is the bit you’ve been waiting for. The North and South guides each have about 300 pages of detailed aires listings. Each listing includes two colour photos, a detailed list of facilities (using a graphical key), GPS co-ordinates, driving directions and information about the local area. They’re easy to understand and I know from experience that they give you a clear idea of what to expect. Wait! That’s not all. At the back of each guide, you’ll find a list of aires that have closed. There are also two text indices – one lists all the aires in the guide with location details. The second is ordered by location name, allowing you to look up aires in a chosen location. Finally, there’s also a list of LPG filling stations. All the Aires France is still just as great as it always was. It’s a bit bigger and a bit older (just like the rest of us! ), but like a good French wine, it’s improved with age. All the Aires France is available direct from the Vicarious Books shop. ← Could your motorhome be making money for you?